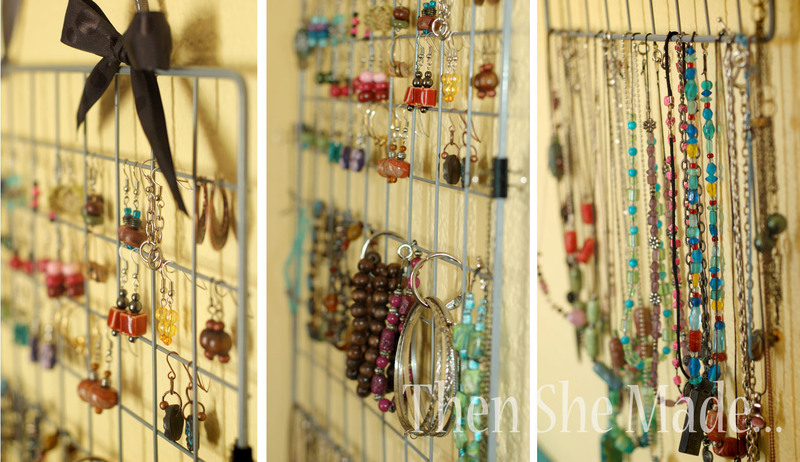 My super awesome sister-in-law, Susie, came to visit us this summer and was asking about by my jewelry holder. She liked the idea and wanted to know where I got it. I'd really never thought much about it. I was just in a pinch for something to hold my jewelry so I used what I had on hand. Is that called upcycling? Well, I'm fixin' to go see her this weekend and decided to make her a holder. Here's how I did it. First though, do you all remember these wire cubes? I say remember because about 5 to 6 years ago they were all the rage with scrapbookers. If you have some of these that you are no longer using in cube form, or that are in storage, then you may want to consider using them to hold your jewelry. 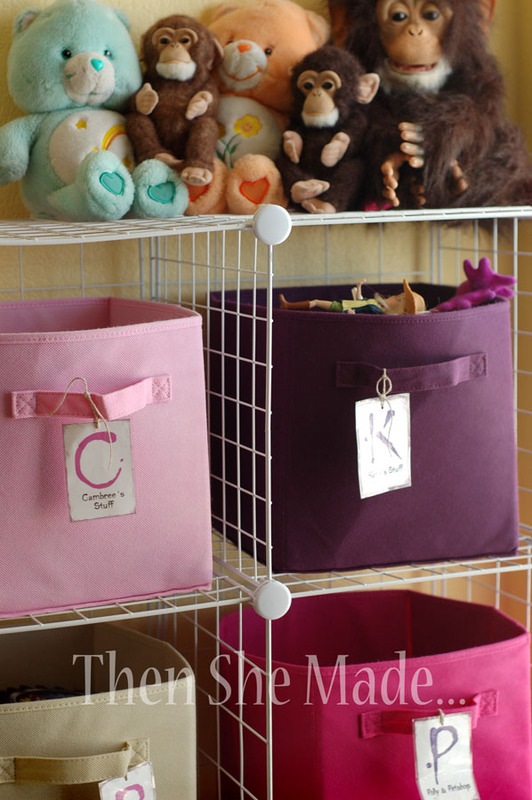 They work great for keeping everything organized and visible. 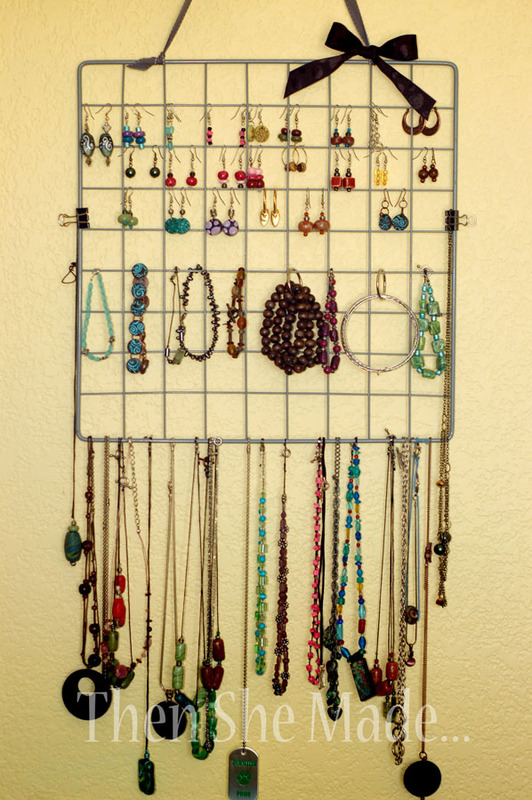 You can keep your earrings, bracelets, and necklaces all in one place. I've even stored rings on here at one point but don't have any on there now. You will need a wire square (one panel from your cube set), some ribbon and scissors. Seriously, that is all. I told you it was going to be easy. So, take a 12 to 15 inch piece of ribbon and tie each end of the ribbon to the top corners on your square. Then, if you want, decorate it by placing a cute bow over top of each knot. That's all! You're DONE!!! Now you just need to add your jewelry. Now, just a couple of quick tips to make this more useful. 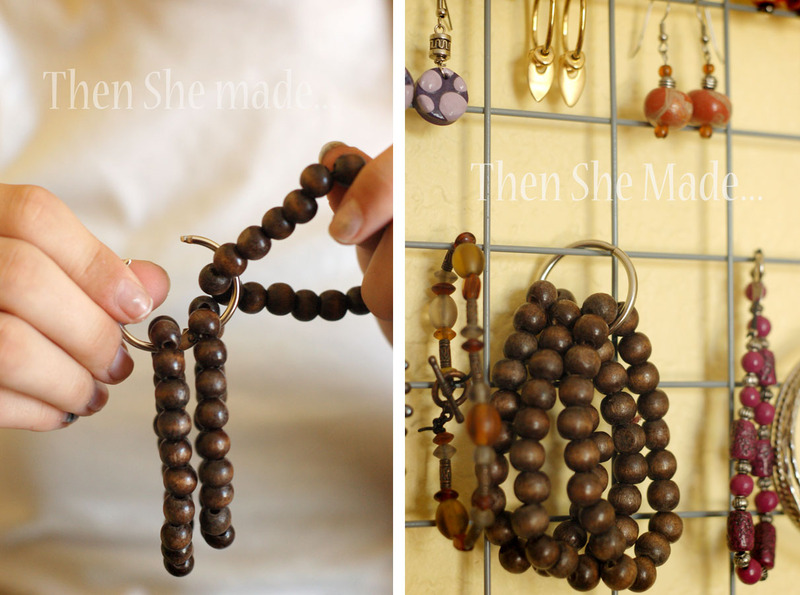 Not all jewelry has a claps and can't hook around the wire form. So, for those items that don't, like bracelets, just grab some office supplies like binder rings, and hook them on just like shown below. You can also use binder clips. 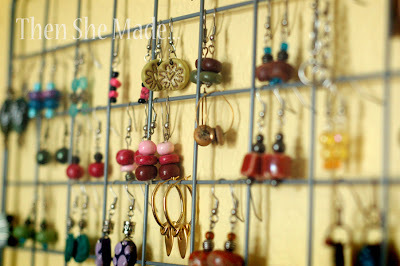 Place them along the sides of the square and then you can clip on your long neckaces that don't have clasps as well. If you look close you can see what I mean. There are two small black binder clips on each side. So, that's all. Really easy and it looks kind of cool too! Oh, and if you don't have these wire cubes, think about using something like a baking cooling rack. That would work too. another awesome idea - one about 6" x 6" would be the size for me! I love your blog!! I'm a jewelry lover/collector - especially earrings - thank you so much for the fabulous idea! 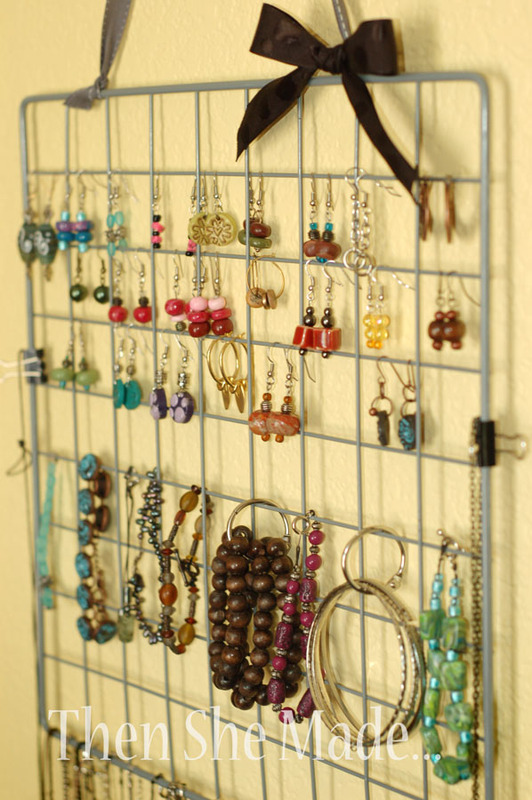 Very neat idea...I've got a couple of those racks lying around. 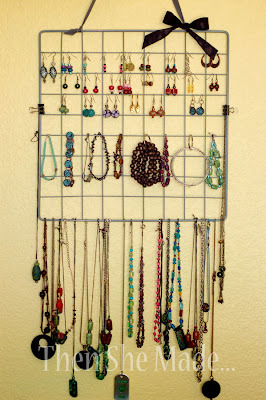 The perfect solution for all my necklaces piled in a basket. Thanks for sharing! I've always loved turquoise jewelry and I'm so glad I read this post - her jewelry is incredible, especially the necklace in the 7th picture. Thanks for sharing and I'll be sure to check out your tumblr.